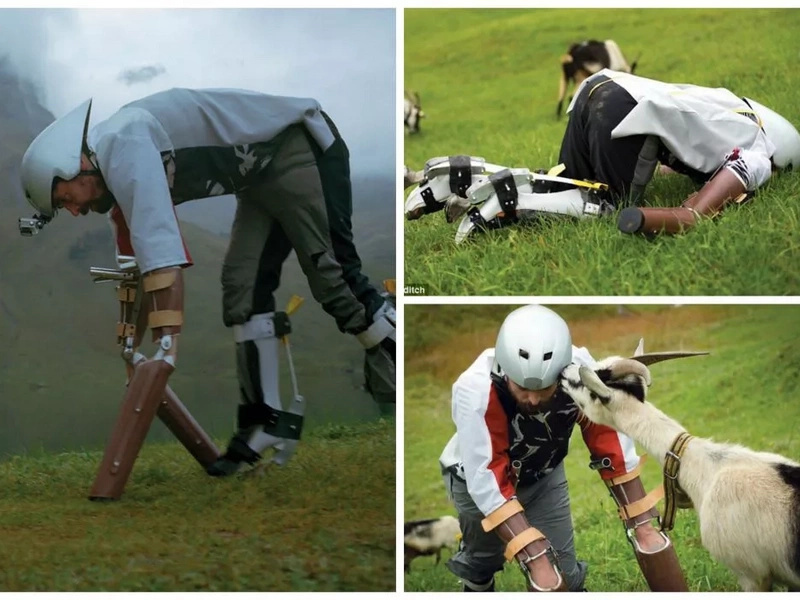 This is the man so intruiged by goats he gave it all up to live with them in the mountains. Thomas Thwaites spent three days as part of a herd in the Swiss Alps while investigating goat behaviour. He used special prosthetic limbs made to enable him to move around on all fours easily. And the designer even considered having a fake stomach fitted to let him to eat grass, just like his four-legged friends. Mr Thwaites cloven-hooved sojourn was aimed at "taking a break from being. He told Mashable: "My goal was to take a holiday from the pain and worry of being a self-conscious being, able to regret the past and worry about the future." But being a goat wasn't a completely care-free existence. He told Motherboard: "I was able to keep up for maybe a kilometre or so on this migration down the side of this kind of rocky mountain, and then they just left me in the dust. "So I spent the rest of the day trying to catch up to them and eventually I found them again, and it was quite nice, in the actual soft grassy pasture bit. "But actually heading down the mountain was petrifying. Because if I fell I didn’t have any hands to stop me from hitting a rock." Thwaites has written a book about his experiences, called ‘GoatMan; How I Took a Holiday from Being Human’.